18 greens, 30 bunkers, and 39 traps create an exceptional, challenging, and rewarding golf experience at Fort Wayne Country Club. David McIntosh laid out the original 9 holes at Fort Wayne Country Club and noted golf course architect William B. Langford of Chicago expanded the course to 18 holes in 1916. As we moved into a new century, Bob Lohmann created the master plan that is currently shaping the course. The quiet, serene surroundings on the Fort Wayne Country Club golf course make for an exceptional golf experience. In 2013, Fort Wayne Country Club did a major renovation with the focus on bringing our greens up to modern standards of excellence. Pure Distinction was the grass choice and is a high performance Bentgrass. Upgrades throughout the golf course make us highly attractive to golfers of all levels. Fort Wayne Country Club’s professional golf staff is ready to assist you with all your golfing needs. Our program features a variety of events, including the traditional Opening and Closing Stags, as well as, Club Championships, Member/Member Tournaments, and our highly anticipated annual Member-Guest Invitational. The Club’s 9-Hole and 18-Hole Ladies' Golf Groups meet weekly on Tuesdays and Thursdays, respectively. Our Junior Golf Program is designed with group lessons for children ages 6 to 18, but private lessons are also available. Each season features a variety of events from tournaments to family golf nights. 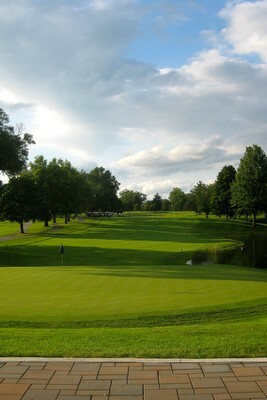 If golf is your game, Fort Wayne Country Club is the place to be. Please contact our PGA Golf Pro, Chad Ayres, at (260) 432-4573 or chadayres@ftwaynecc.org.